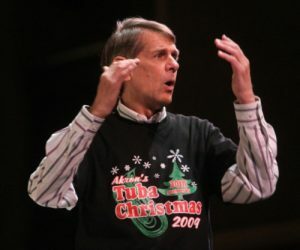 Tucker Jolly is professor emeritus of tuba and euphonium at The University of Akron He has a Bachelor of Music from the University of North Texas and a Master of Arts in Music Performance from the University of Connecticut. Mr. Jolly has been principal tubist with the Fort Worth Symphony, the United States Coast Guard Band, the New Haven Symphony, and the Ohio Chamber Orchestra. He has performed with the Blossom Festival Concert Band , the Cleveland Orchestra, and the Canton Symphony Orchestra. From 1970-1980 he performed with the Eastern Brass Quintet and was the tubist on that ensembles three recordings. He has also recorded with the Detroit Concert Band under the direction of Dr. Leonard B. Smith. Mr. Jolly was principal tubist with the Akron Symphony from 1986-2008. Mr. Jolly is also known in the Akron area for coordinating and conducting the annual Akron TUBACHRISTMAS.